The story begins in the early 1950s, as Iron Ore of Canada was nearing completion of their Quebec North Shore & Labrador Railway between Sept-Iles and Schefferville QC. This was a massive project, with a mainline consisting of two full operating subdivisions running a total length of 357 miles (over 200 of which were inside Labrador), and all of it located in the harsh and desolate landscape of Labrador and the Quebec north shore. The railway was completely isolated from the North American rail network, requiring all their locomotives and rolling stock to be shipped by lake freighters down the St. Lawrence River to Sept-Iles QC. The QNS&L locomotive roster began with a fleet of GMD-London built ‘Geeps’, specifically 24 model GP7 units (road numbers 100 to 123), and 54 model GP9 locos (road numbers 124 to 177), all delivered between 1953 and 1960. Bellequip #118 (ex-QNSL GMD GP7 – blt 1953) sporting neatly patched CP Rail-style Helvetica bold/italic font at Smiths Fall ON on 20 Oct 1971. Bruce Chapman photo. On an interesting side-note, the paint scheme the QNS&L selected their new diesels to wear came straight from the EMD styling design scrapbook. While that in itself is not unusual (several railroads chose GM designed schemes) they selected the same one chosen by the New York, Ontario & Western RR over a decade earlier. For anyone unfamiliar with the NYO&W, they operated through the Catskill mountains of New York state while avoiding any sizable towns along the way; and thus unsurprisingly became bankrupt during the 1930s, and fully liquidated by 1957. The ‘O&W’ dieselized early hoping the cost savings could help their railroad, and as a result they never rostered anything newer than their final 1948 purchase of a couple of F3A/B sets. So for any NYO&W fans who might be reading this, if you ever wondered what an ‘O&W’ Geep would look like, you should check out old photos of QNS&L GP7/9s. 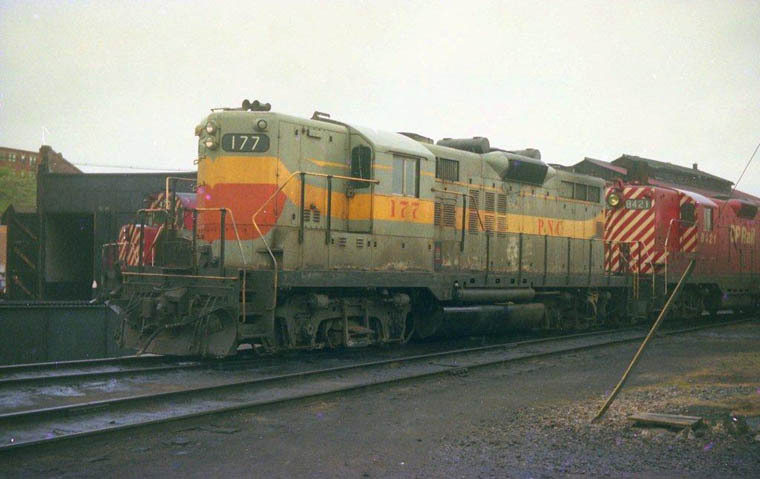 PNC 177 (ex-Bellequip, nee-QNSL 177) was the last GP9 received by the Quebec North Shore & Labrador Rly in May 1960. 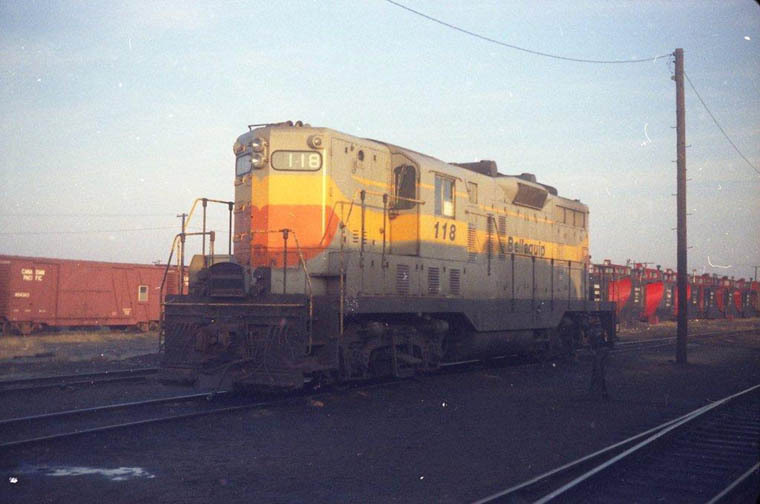 It is seen here by the Medicine Hat AB roundhouse along with CP GP7 8421 on 18 May 1974. Bruce Chapman photo. Actually the QNS&L was not the only Canadian railway to select a GM pre-designed diesel scheme worn by a US railroad. 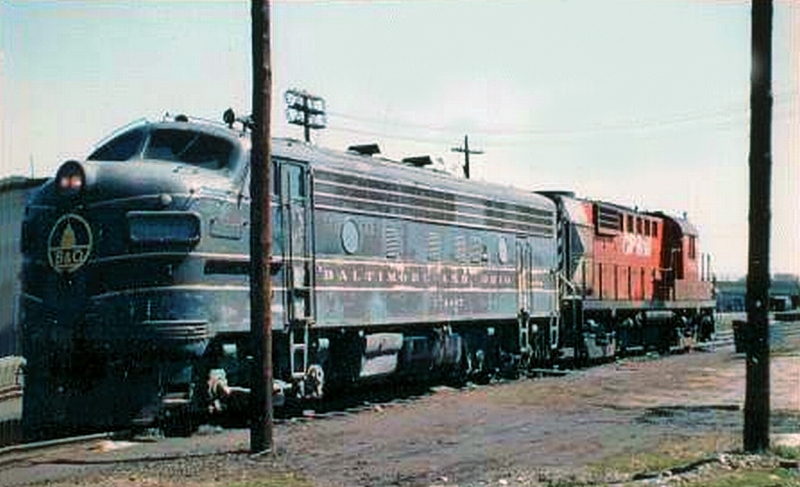 The Algoma Central selected the Delaware Lackawanna & Western (Lackawanna Road) passenger scheme for their locomotive fleet. 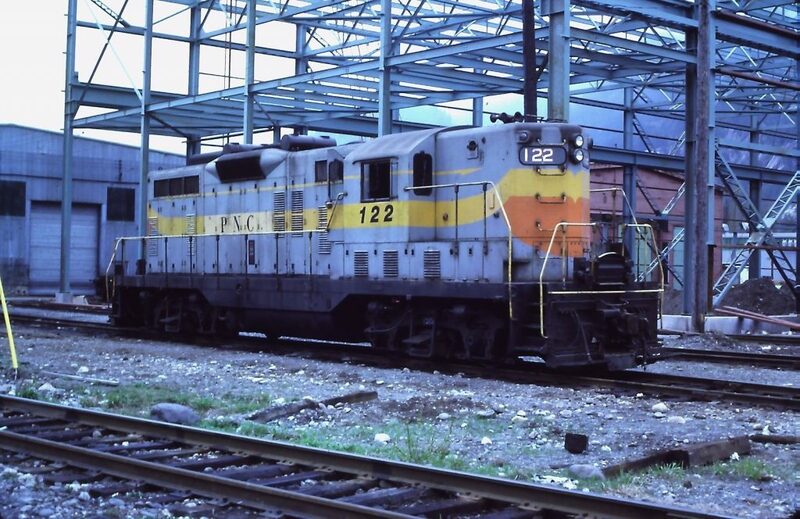 But unlike the ACR who kept their Lackawanna colours until the end, the QNS&L dropped their attractive NYO&W colours for a bland dip gray with yellow end-stripes scheme in the mid ‘60s. The Quebec, North Shore & Labrador is hard on its locomotives. After all they are an isolated railway that operates heavy ore trains over rugged terrain through extreme weather conditions. So the QNSL Geep-fleet started to be retired early, once the company began purchasing large numbers of SD40/SD40-2 locomotives to replace them. Initially the QNS&L sold 17 GP7 units and 14 GP9 units to Canadian Bellequip Ltd of Montreal in September 1971. If you had never heard of Bellequip, you are not alone. They were a short-lived Canadian locomotive leasing company who only lasted between 1971-72. The rumour back then among CP employees was that Bellequip was started by some CP directors to see if leasing locomotives made money, but this was never confirmed. 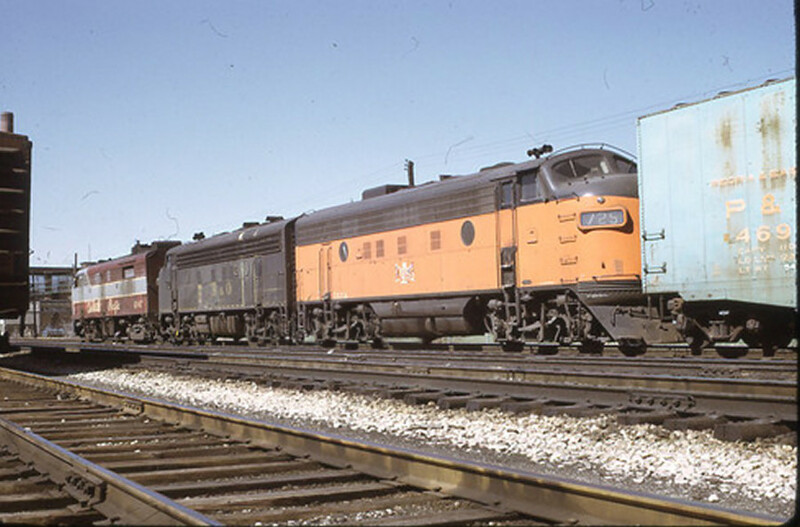 All ex-QNSL Geeps were loaded onto lake freighters for their one-way trip to Montreal, and of these most were immediately leased to the perennially powershort CPR. Once they arrived on CP property they were all cycled through St Luc shops, where their QNS&L markings were removed and replaced with ‘Bellequip’ lettering and road numbers in a black Helvetica bold/italic lettering font, the same used by then new CP Rail. While the dip gray ‘60s repaints did not look so great with the patched Bellequip lettering, the units still wearing the original NYO&W-inspired scheme seemed to be treated better, as most were carefully patched to mesh with their original paint jobs. On February 29, 1972, established US locomotive dealer Precision National Corp purchased the entire fledgling Bellequip locomotive fleet, and these Geeps changed hands yet again. As before they were cycled through the CPR’s shops, but this time more brutally patched with new PNC lettering. 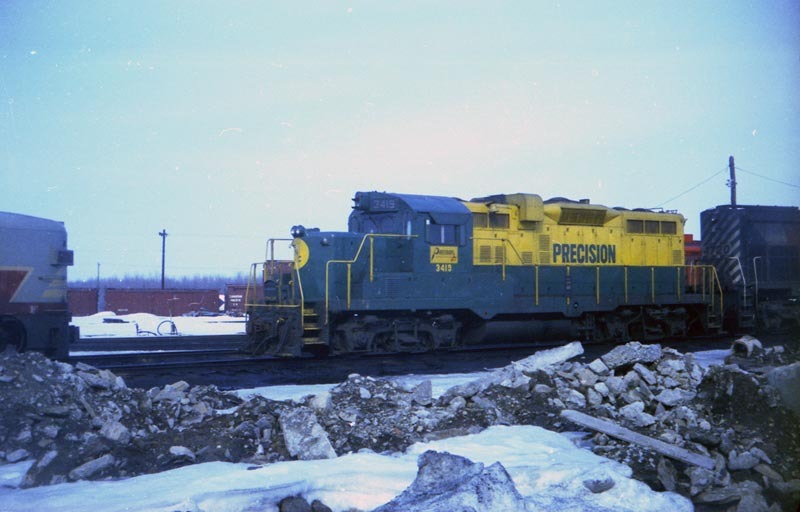 In June 1972 a further 3 GP7’s and 17 GP9’s were sold to PNC with some leased to CP and 15 to CN. Eventually the 15 units leased to CN also wound up on CP Rail by November of 1972. For the record, the 24 original Bellequip units on CP Rail (as of 01Nov71) were ex-QNSL – BQ (Bellequip) #’s:- 100 104 108 110 111 112 113 114 118 121 122 123 124 126 127 130 135 142 148 150 152 158 162 166. 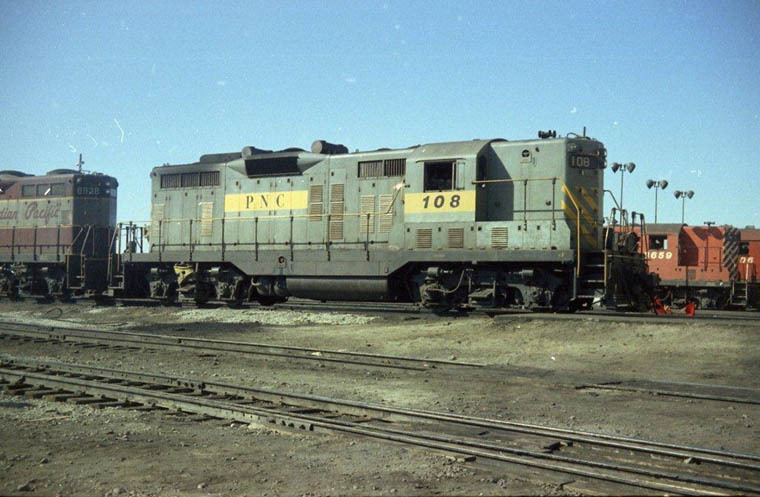 By January 1973, when the CN leased units were added to the now PNC (ex-BQ) fleet, the 36 ex-QNSL units on CP Rail were #’s:- 100 104 108 110 111 112 113 114 116 118 120 121 122 123 124 126 127 130 132 135 137 138 142 143 144 145 148 150 152 158 162 164 166 170 171 177. 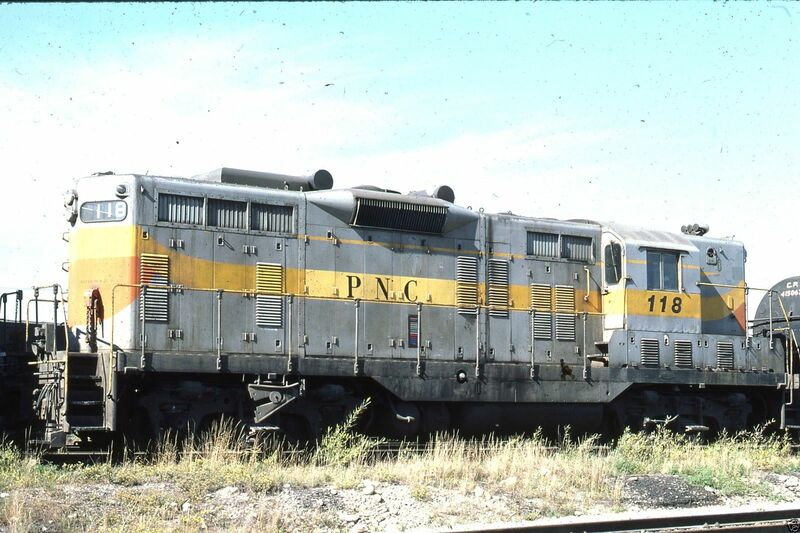 There is some discrepancy to whether QNSL GP7 #117 was ever within the PNC fleet. Bruce Chapman records it was leased in June 1974 (from his personal records when working for CP’s power bureau at the time) but this was never listed in a published all-time list in Extra2200South. This also would incorrectly put 46 PNC geeps on lease to CP Rail between 1973-74 when records only show 45. It is possible that the 117 was planned to be part of the fleet, but ended up becoming a parts source instead. PNC’s other non-QNSL leased units on the property were GP7s 969, 970 and 971 (ex-Detroit, Toledo & Ironton), GP7s 1505, 1506 & 1507 (ex-Florida East Coast) along with GP10s 3419, 3445 and 3634. These final three were ICG Paducah-shops rebuild units that were refurbished specifically for Precision National, and they wore the full PNC green/yellow paint scheme. Following the QNS&L’s lead, by 1975 the CPR had purchased over 200 new SD40-2 locomotives from GMD of London. With all these new units, an economical slowdown, and decreased grain shipments to the USSR and China; they began to return all their leased units. CP Rail also retired a large number of older units over 1975, including the entire fleet of CLC and Baldwin built units, in addition to storing all MLW FA- and FB- locos, and a good number of RS-3 and -10 diesels. By April 1975 all the PNC units went off-lease and were either stored at St Luc or Alyth yards, or returned to Precision National. Several of the tied-up ex-QNSL units went on a short-term lease on the British Columbia Railway for a few months in 1975. After they all returned from lease, PNC sold most of these units to the C&NW and ICG. Many of these units went on to various regional and shortline railroads in the US through the 1990s and 2000s. In fact there are still a handful of ICG-rebuilt GP10s of QNS&L heritage still active as industrial switchers. So the saga of the Bellequip Geeps has yet to finish completely.